SuperFetch keeps track of which applications are being used the most on your computer and tries to pre-load those applications so they’re available before you need them. Vista handles SuperFetch automatically; you don’t need to change anything. ReadyDrive takes advantage of “hybrid” hard drives — the drives with significant amounts of integrated flash memory — to boot faster, come back from “sleep” faster, and minimize battery drain. Vista handles ReadyDrive automatically, too. ReadyBoost helps PCs with limited amounts of memory by using a flash memory drive to augment the functions of regular memory. Vista uses the flash memory as an adjunct to regular memory. Unlike the other two acceleration technologies, you have to operate ReadyBoost manually to get the benefit. If you have 1GB or more of RAM on your computer, ReadyBoost won’t do much for you. However, if you’re limping along with 256MB or thereabouts, ReadyBoost is definitely worth the effort. If you’re somewhere in between, and you have a fast USB drive handy, give it a shot. You may be pleasantly surprised. Plug a fast key drive (a USB drive or Flash Memory drive) into any handy USB port. Vista brings up the AutoPlay dialog box. Don’t worry if you have to wait a minute or two for this to appear. Older key drives tend to use slower memory. Given a choice, go for a newer key drive with faster memory access times. Choose Speed Up My System Using Windows ReadyBoost. 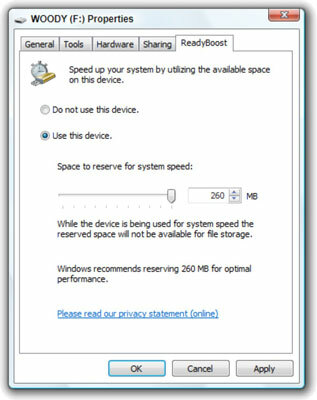 Vista shows you the key drive’s Properties dialog box, on the ReadyBoost tab. Choose the Use This Device option and adjust the slider to reserve the indicated amount of space for ReadyBoost. ReadyBoost appears as a property of the drive itself. Any space that’s left on the drive can be used for data — but the ReadyBoost part is off limits. If you have a particularly slow computer, it might be worth it to get a larger flash drive (2–4GB) that is devoted just for ReadyBoost. ReadyBoost starts immediately. You can take the key drive out at any time without fear of clobbering anything. Vista stores data on the ReadyBoost key drive in an encrypted form. If you lose the key drive, it would be exceptionally difficult for anyone to crack the encryption and figure out what you had running on your computer.